Tired of hotels, motels and even crowded campground? Then consider a houseboat vacation on Florida’s scenic Suwannee River. 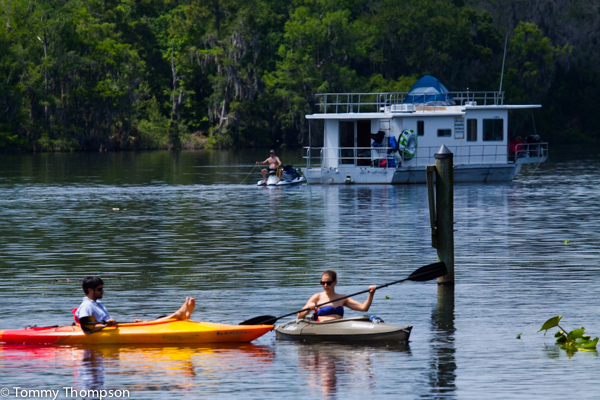 Consider renting a houseboat from Miller’s Marina in Suwannee. After a quick training session, you get your captain’s papers and are ready to go. The 44-foot houseboat comes complete with flush toilet, shower and full kitchen, and sleeps six to eight people. Have a serious party weekend or just relax with family as the boat chugs along at a leisurely seven knots down this scenic river. Keep packing to a minimum because chances are, you’ll be living in your swimsuit. For the most part you’ll anchor up in the middle of this lazy river, but you’ll also have the opportunity to stop at places like Manatee Springs and enjoy the swimming in the crystal clear 72-degree waters. Houseboats make great "motherships" for kayakers, anglers and folks who enjoy riding personal watercraft.